Terms and Conditions HappyFarmer.nl, established in Oirschot, The Netherlands. Version valid from 31 August 2015. 1.1 The website HappyFarmer.nl is property of HappyFarmer.nl, registered at the Dutch Chamber of Commerce (Kamer van Koophandel), trade number: 63837811. 1.2 These terms and conditions are applicable to every offer, delivery and agreement that was brought, performed or contracted to you by HappyFarmer.nl, unless agreed in writing. 1.3 Acceptance of a quote and/or provision of a contract means that these terms and conditions apply to this quote/provision. The Customer renounces any applicability of their own terms. Any customer-resources on common law are not allowed. 2.1 Any offer of HappyFarmer.nl is without obligation, unless emphatically agreed in writing. 2.2 Commands and changes are only binding if accepted or ratified by HappyFarmer.nl, whether or not in writing. Without prejudice noticed earlier, a quotation expires in any case after five working days from the date of the quotation. 2.3 There is no obligation to supply a part of a composed quotation against a corresponding part of the total price. 2.4 As far as not otherwise agreed, the prices for delivery are “non-delivery free”. 2.5 Quotations are always made on the basis of the at the time of the offer and/or command-current prices and apply exclusively on the day of listing. If one or more cost price factors of the offer increase, HappyFarmer.nl is authorized to increase the offered price. HappyFarmer.nl will inform the customer in writing. HappyFarmer.nl will also give the customer a time limit of seven days to dissolve the agreement in writing. If the price increase is being established after the purchasing-agreement is realized, HappyFarmer.nl will be obligated to deliver against the agreed price. In case the price increases by a legal VAT rate, HappyFarmer.nl is authorized to accordingly raise the price. 2.6 Every offer is based on delivery against normal conditions and during normal working hours, unless explicitly stated otherwise. 3.1 All prices are subjected of typographical errors. 3.2 All prices are exclusive shipping costs and exclusive V.A.T..
3.3 Payment of the purchase amount must be made when ordering the product. Any remission, restitution or deduction cannot be made, unless explicitly stated otherwise. 3.4 In case the invoice is being sent to you, you have a term of payment that lasts 7 days. After receiving the whole purchasing amount, delivery can take place. 3.5 Deviating paying-agreements only apply if they are agreed in writing between HappyFarmer.nl and the customer. 3.6 The customer needs to assume the correctness of the by HappyFarmer.nl drafted invoice and invoice-oversights. 3.7 In case the customer did not pay within the agreed terms of payment, the customer shall be deemed to be in default by operation of the law. In that case, HappyFarmer.nl is authorized (without any formal notice) to charge the whole payment due, the legal interest, enhanced by 1% from the day of the respective invoice. All collection fees, both judicial and extrajudicial, caused by the customer are for the account of the customer. The extrajudicial collection fees are 15% of the capital sum with a minimum of € 150,-. 3.8 HappyFarmer.nl is, regardless any agreed terms of payment, in any time authorized to expect certainty about the payment and to strike out the execution of the agreement in case this certainty cannot be given. In that case, the buyer has the choice to pay the ordered goods in cash, under the settlement of a possibly paid advance OR cancellation of the agreement with the observance of the provisions brought by you in article 3.10. 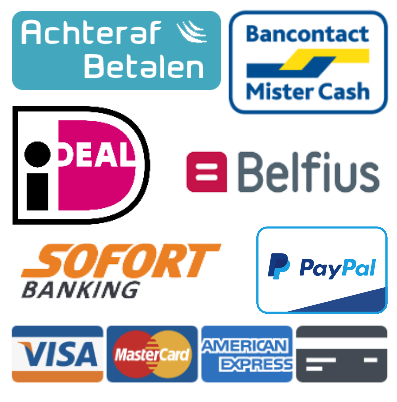 3.9 Payments that take place on the account of the customer to HappyFarmer.nl will always be used to pay the oldest outstanding post at the expense of the customer, delay-interests and other costs included. 3.10 In case a customer did not pay yet at the moment of delivery, it is possible that HappyFarmer.nl does not proceed the actual delivery. In case and as far as HappyFarmer.nl does not proceed to delivery, the customer has to pay for the costs of the transport and an amount of € 5,- per day, or a part of the day, until delivery proceeds. These costs are used to cover the costs that come with the storage of the good(s). 4.1 With delivery, we mean the factual disposition to the customer or to the person(s) that are in the risk-area of the customer. From the moment of delivery at the address of the customer, the risk of the bought objects are for the account of the customer. HappyFarmer.nl is not obliged to warranty. 4.2 The ownership of the delivered objects starts when the customer paid the purchase price (and possible interest). The ownership does not transfer by only transferring the bought objects. In case the customer did not fully pay for the goods and the customer transfers, uses or pawns the ordered goods and/or in case of bankruptcy or suspension of payment and/or got attached on property the customer must inform HappyFarmer.nl by writing. If the customer did not informed HappyFarmer.nl by writing within 5 days, the customer forfeits a fine of at least three times the not payed sum of money. 4.3 The maximum delivery time for buying on distance comes to 30 days. In case there will be a longer delivery time for a product, this will be explicitly announced to you by HappyFarmer.nl In case the delivery time cannot be guaranteed by HappyFarmer.nl, we will inform you as soon as possible. A new agreement will be made about the delivery time or you (as a customer) have the right to dissolve the agreement. Already made payments have to be refunded by HappyFarmer.nl within 30 days. 5.1 In case a product is delivered by HappyFarmer.nl but the product is visibly damaged, the customer has to contact HappyFarmer.nl immediately or within 24 hours after receiving the product. In case the products are treated by the buyer, the buyer needs to satisfy himself of the good state of the product immediately. In case the damage is not visible on the outside, the customer needs to contact HappyFarmer.nl within two weeks after receiving the product/goods. The reclamation has to contain a description of the detected damage. 5.2 Little – in business permitted or technical unavoidable – departures in quality, quantity, width, color, size, finishing etc. cannot be a ground for technical reclamations or complaints. This also applies to delivered goods, bought on sample. 5.3 The in article 5.1 decided terms also count on the sum on invoice, be it that this reclamation has to be made at HappyFarmer.nl within 5 days, accompanied with a motivational writing. 5.4 Reclamations on any other way made to middleman or retailers and later received by HappyFarmer.nl are of no legal value an cannot bring any juridical consequences. 5.5 Every right of reclamation will fall into disrepair if the above mentioned terms will not be taken in consideration and in case third parties have done activities on the goods/materials for HappyFarmer.nl. 5.6 Reclamations never give the customer the right to apply compensation or debt-comparison. 5.7 Unless HappyFarmer.nl explicitly agrees, the customer is not free to return goods bought in the web store or directly at the company to HappyFarmer.nl. 5.8 In case a sweeping guarantee is given by the manufacturer of the delivered goods to HappyFarmer.nl, the guarantee will also apply to the customer, but only when the deliverer decides that the reclamation is correct. 5.9 Guarantee decisions only apply to the agreed corresponded use of the delivered goods or executed work. Injudicious acting or failing care for the delivered goods shuts out every reclamation and lapses all guarantees and warranty. 6.1 HappyFarmer.nl will never be responsible for direct or indirect damage, company- and/or stagnation damage. Which means delay in the delivery of the ordered goods, caused by the damage on the by HappyFarmer ordered goods, except for purposed and/or huge dept. 6.2 HappyFarmer.nl can never be held to any compensation caused by damage in any shape or cause however, higher than the total amount from the transaction between HappyFarmer.nl and the customer. 6.3 The customer explicitly protects HappyFarmer.nl for every claim of third parties, which includes the personnel of the customer, to compensate damage in any shape, suffered by third parties. 6.4 Every right of reclamation will expire if the above mentioned terms are not taken in consideration. 6.5 Reclamations never give the customer the right of compensation, debt-comparison or postponing his obligations. 7.1 After receiving the ordered goods, the customer has the right to annul the underlying agreement with HappyFarmer.nl within seven (7) working days. The customer does not have to hand over any reason. 7.2 In case the customer wants to dissolve the agreement discussed in point 7.1, the customer has to announce this in writing (e-mail or letter) to HappyFarmer.nl. After judgement, the customer has to send the product back to a by HappyFarmer.nl set retour-address. This has to be done in the original, undamaged packing. Opened packing will not be taken back; opening the packing means that you want to keep the product(s). The customer needs to carry the risk and costs of sending. 7.3 In case the customer already did (partly) pay for the product at the moment that the customer wants to dissolve the agreement (article 7.1 and 7.2 of these terms and conditions), HappyFarmer.nl will refund the payment within fourteen (14) working days after HappyFarmer.nl received the returned good(s) from the customer. 7.4 HappyFarmer.nl keeps the right to refuse returned goods and products or only partly refund the already paid price in case HappyFarmer.nl has the idea that the packing is opened, the product is used or damaged by the guilt of the customer (other than HappyFarmer.nl or the deliverer of the product). 7.5 In case a product is returned to HappyFarmer.nl and HappyFarmer.nl has the idea that the product has been damaged by guilt of the customer or other risks to take by the customer, HappyFarmer.nl will inform the customer in writing (letter or E-Mail). HappyFarmer.nl has the right to put any depreciation on the account of the customer. 8.1 If it appears that (further) execution of the agreement is nog possible for HappyFarmer.nl before or during the execution of the agreement with the cause of “circumstances beyond one’s control”, HappyFarmer.nl has the right to postpone or break the agreement without giving any compensation or refunds. 8.2 With “Circumstances beyond one’s control” is meant every circumstance except the actions of HappyFarmer.nl, by which the normal execution of the agreement is interrupted. Examples are: weather circumstances, strikes, wars, molest- fire- and water damage, damage to machines, hindrance or delay from the transport of materials or products, measurements of the government and their consequences. Not or not in time meeting the obligations by the deliverers of HappyFarmer.nl and in general all other happenings that withdraw the responsibility of HappyFarmer.nl (illness of personnel of HappyFarmer.nl, third parties and deliverers) are also titled as “Circumstances beyond one’s control”. 9.1 In case the customer does not, not, not decent or not in time meet any obligation, also in case of bankruptcy of moratorium of payment of the customer or his/hers company, he/she will be considered guilty on omission. This gives HappyFarmer.nl the right to postpone or break the agreement without any proof of default and without judicial intervention. HappyFarmer.nl will not be held to any guarantee or compensation. In this case, every demand that HappyFarmer.nl receives trough the agency of the customer is immediate redeemable. 9.2 In case the customer voids a given order, on behalf of any reason, he/she ows a compensation of 25% of the price of the ordered product(s) to HappyFarmer.nl, unless HappyFarmer.nl wishes observance. The right of compensation of HappyFarmer.nl will remain undiminished, because of profit-division and damage caused by annul. The judicial instances in the district Oost Brabant, Eindhoven, are authorized by exception to get information about disagreements between HappyFarmer.nl and her customers. In case any of the decisions from these Terms and Conditions are canceled or declared invalid, the remained decisions will stay the same. HappyFarmer.nl and the customer will consider new decisions to replace the canceled or invalid decisions. The canceled or invalid decisions will hereby be taken in consideration.